Let us not be sentimental, however: There’s no tube amp in the world that for laboratory accuracy will not be eclipsed by any competently or better-designed solid-state amp. But those last few degrees of accuracy as such are not necessarily the be-all and end-all of music reproduction. A personal example: A close friend, an amateur musician and audiophile whose ears are as discriminating as those of any reviewer I know, dropped by not long after I had received this latest MC275 for review, accompanied by another Mac retro-classic, the C22 preamplifier. Now this man—who uses solid-state gear, I should point out—knows the sound of my system virtually as well as he does his own. After scarcely a minute’s worth of listening to my Quad 2805 ESL speakers, the source a CD of Dvořák’s “American” string quartet, he said, “This sound is just lovely, absolutely lovely, completely involving and beautiful. Everybody should hear it just to experience how beautiful music reproduction in the home can be.” He’s right. If it wasn’t the “best”—that pesky word again—sound I’ve ever had in my home, I’ve rarely had any I’d pronounce better. Transients? Completely natural and realistic, just as these things sound outside of recordings, with force and impact but never with the kind of exaggerated “speed” that screams “high fidelity”! There is resolution galore but not of the sort that calls attention to itself, a wealth of detail to savor as you wish yet that is not in least coercive or excessive. At no time did I find myself wishing for more or worrying I wasn’t hearing what was there. Definition and clarity top to bottom are superb. Indeed, the circuit improvements in the 275 mark it out as clearly a better amplifier than the version IV I reviewed over ten years ago, splendid as that one was. Well-recorded rock music sounds fabulous. Admittedly, I don’t listen to a lot of it, but the things I do I like a lot, such as the Rolling Stones or Buddy Holly. Or take Paul Simon’s Graceland, which the pair send up with sensational power and drive, where such qualities are called for, or delicacy and subtlety, where they are called for. Every strand in the texture of “The Boy in the Bubble” emerges with a clarity so revealing that I doubt many solid-state amplifiers could materially better it, while the a capella singers in “Under African Skies” are projected with lifelike warmth and vitality. These components were originally designed at a time when serious audio designers and audiophiles used classical, acoustic jazz, and mainstream pop and folk as references; that is, music for which there is a live, acoustical equivalent. These new Macs really thrive on such music. Take the Dvořák quartet I referred to at the outset: Get the playback level right with accommodating speakers and you really could almost be tricked into believing the players are arrayed before you, such is the solidity of the imaging, the tactility of the reproduction. Suffice it to say that whether it’s small music or big, this pair does soundstaging and imaging superlatively. The opening of Stokowski’s Romanian Rhapsody (on vinyl) has breathtaking power, definition, and real reach deep into the bass, with a quality to the lower octaves that I wish to emphasize: It is not that “tight” kind of bass which so many audiophiles (and reviewers) seem to delight in but which has no real counterpart in reality. Rather, bass instruments are subtly rounded and highly dimensional, with great bloom if the recording allows for it, yet never spongy, as tube bass can often be, even in several modern designs. Voices. Gorgeous. In combination with Harbeth’s new Monitor 40.2, the best three-way speaker system I’ve ever heard (review forthcoming), these Macs made for some of the richest, most vibrant and beautiful vocal reproduction I’ve ever heard in home playback systems, whether it’s the Anonymous Four or Peter, Paul, and Mary, Sinatra or Fitzgerald, choral groups like Conspirare or Theatre of Voices. Anything and everything throughout the midrange has the warmth, roundedness, and body for which the best vacuum-tube reproduction has always been prized. When I reviewed version IV of this amplifier I noted that it was not quite as transparent as the best solid-state gear. If that is still true, the margin has so narrowed as to be of virtually no consequence. I have recently been the object of some sarcasm from another reviewer for insufficiently valuing small, not to say really tiny sonic differences among components. So as not to offend further in this regard, let me say that, as with other marginal differences, this reduction in transparency is there to be heard if you really want to concentrate upon it to the exclusion of everything else. That said, I personally judge it insignificant. I also noticed a slight darkness to the presentation with version IV, but not with this new one. All that attention Mac paid to extending the bandwidth with the new transformers has resulted in considerably more top-end extension, clarity, and definition. Yet there is no harshness, glare, or brightness that I can attribute to the amp or the preamp. 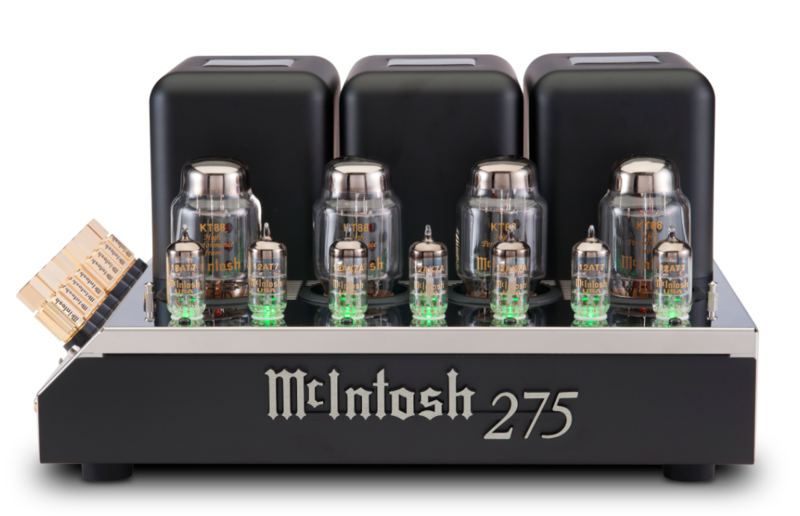 By the way, there is no mystery about why the MC275 sounds so neutral, especially as compared to most other tube amplifiers known to me: Its output impedance is a mere 0.4 ohms. This is comparable to many solid-state units and in marked contrast to a lot of tube amplifiers, on which I’ve seen output impedances north of 2 ohms (no such amplifier is capable of sonic neutrality). Power. It’s common knowledge that, owing to their greater output voltage swing, tube amps generally sound louder than their nominal ratings might indicate. This proves to be the case with the MC275. For one thing, the amp puts out an easy 90 watts a channel, as opposed to its rated 75. For another, the circuit is exceptionally stable, so it doesn’t frazzle when pushed too hard. All that said, the Harbeth Monitor 40.2s are capable of playing very loud, and there were rare times when the 275 sounded fractionally undernourished on really big material (the Quads won’t play as loud as the Harbeths, so this was never an issue with that combination). The spectacularly recorded hammerblows on the Zander Mahler Sixth on Telarc—the best recording quality sonics of this piece I know—land with tremendous force and impact. I compared the 275 to the solid-state Pass Labs X150.8, which generates double the power. Though the Pass was slightly better in impact, the Mac was by no means left at the post. I must point out that I was playing the speakers much louder than I would normally do, and louder than the relative level would be if I were listening to a large orchestra live, even in the first few rows (I’ve heard this symphony from row two in Disney Hall, the Los Angeles Philharmonic conducted by Dudamel, whose hammerblows are cataclysmic.). It is well to keep in mind, too, that the Pass is considerably more expensive than the 275’s $5500 and double the rated power. But the 275’s 75 watts per channel can be strapped for double the power when it is used in bridged mode as a mono amp. I didn’t have a second 275, but I suspect the already-small gap in dynamic freedom would have been narrowed even further by a pair of 275s.